The ancient celts supposedly believed that on Halloween, burial mounds would open up and spirits could cross back and forth from their world to ours. 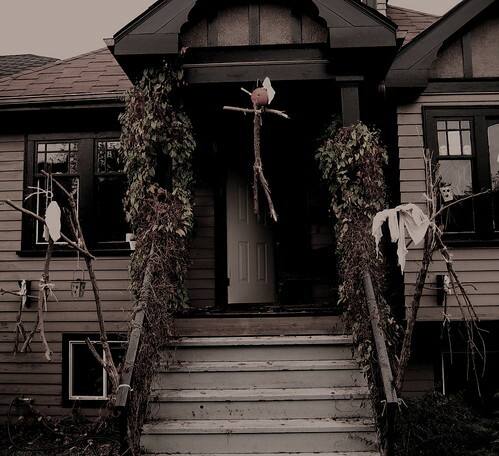 I like that a lot more than store-bought cartoon ghosts in the window, so this All Hallow’s Eve at die Kommune, we decided to paganize things up a bit with sacrificial pumpkins and stick men spirits all over the yard. Not that it has anything to do with actual celtic belief, it’s just that I love the idea of Halloween’s primal, pagan undercurrent, and the dark, fall-inspired creativity of the holiday. Usually I get that out of my system with the Parade of Lost Souls, but since it was canceled this year, I had to do it all myself with zombie costumes and creepy yard decorations. This was written by Eric, your haikuist. Posted on Monday, October 31, 2005, at 11:54 pm. Filed under unfiled. Bookmark the permalink. Follow comments here with the RSS feed. Both comments and trackbacks are currently closed.